Despite the precarious nature of politics in Northern Ireland, the emerging political differences on the question of the UK’s EU membership may not prove particularly divisive during the referendum, writes Christine Bell. However, she suggests that the institutions built around the peace process would be seriously undermined if the European frameworks upon which they are dependent are removed by UK exit from the EU. The Northern Irish government is a power-sharing government: it involves a compulsory coalition in which the two biggest parties, the Democratic Unionist Party (DUP) and Sinn Féin, essentially share the first ministership. The First Minister is the DUP’s leader Arlene Foster and the Deputy First Minister is Sinn Féin’s Martin McGuiness, but this nomenclature is slightly misleading as in fact both have equal powers and can only act together as ‘the Office of the First Minister and Deputy First Minister’ (OFMDFM). The DUP has come out in favour of leaving the EU while Sinn Féin has come out in favour of remaining. So the first key question is: How does a schizophrenic OFMDFM work in practice, and to what extent does navigating the referendum campaign risk further destabilising the power-sharing government? One can see the impact of division on a single party government at the level of the UK and the lifting of collective responsibility, but that is a context of a party that had a single manifesto and ideology at the outset. As regards this question, however, there are some grounds for cautious optimism. Both Sinn Féin’s and the DUP’s positions were predictable and neither was in reaction to the other. Moreover, neither party is unequivocally confident in its position. While, in the words of Foster, the DUP ‘has always been Eurosceptic in its outlook’, the party has a core rural constituency (to which Foster herself belongs) made up largely of farmers. This community is deeply worried about the uncertainty of Brexit. Farmers depend on a whole range of EU grants and schemes to which their entire financial outlook is currently tied. They are also physically and economically connected to the Republic of Ireland. It is unclear how either the UK government or devolved government would step in to replace current funding, how long it would take, and what would happen in the meantime. Moreover, while agriculture is devolved, that devolution is constrained and mediated (as in all devolved regions) by EU law. Shifting policy areas like this into a less constrained devolved setting could open up new issues to cross-community contestation in unpredictable ways. At every stage in this European negotiation process we had hoped to see a fundamental change to our relationship with Europe. In our view, we see nothing in this deal that changes that outlook. Therefore we will on balance recommend a vote to leave the EU. That ‘on balance’ is important – for the DUP, it is extremely nuanced. Interestingly, since that statement even a nuanced ‘leave’ position has become somewhat isolated within Unionism: the once-dominant and fast-resurrecting Ulster Unionist Party has come out in favour of remaining. The influential and historically unionist Ulster Farmers’ Union has also said that there is no compelling case for Brexit, citing concern about subsidies, lack of alternative funds and the importance of the EU export market. A similarly nuanced position in favour of ‘remain’ has been taken by Sinn Féin again under pressure of contradictory impulses. For their part, Sinn Féin may be great Europeanists now, but their record on Europe has not always been so enthusiastic. Notably, they opposed the Lisbon Treaty campaigning for a ‘no in the first Irish referendum – a position that was successful. Admittedly, this campaign is not about whether to give more powers to Europe – rather it is about staying or leaving altogether. However, Sinn Féin’s previous opposition to Europe was driven both by an ‘Ireland’s interests’ argument and a leftist tinge rooted in the view of Europe as a negative capitalist club of elites. Neither of these impulses are irrelevant to this debate and neither has entirely gone away. Added to this, Sinn Féin is an abstentionist party in the UK Parliament on the grounds that, as Britain should not interfere in Ireland, so they will not interfere in British political decisions. It is therefore potentially problematic internally for them to campaign in a fundamentally ‘British’ decision. Their move to actively campaign against Brexit in this referendum has resulted mainly from their electoral ambitions in the Republic of Ireland. As these have grown over time, the party has firmly realised that being Eurosceptic in Ireland is hugely unpopular – a little like opposing the NHS in the UK. Moreover, as discussed further below, the European context was vital to the Northern Ireland peace process, on which their success in the North also depends. These factors have pushed them to overcome their commitment to abstentionism and ‘non-interference’ in ‘British affairs’. While both parties have jumped, predictably, in different directions, they do so with an amount of internal disquiet. As a result, they have nuanced their positions fairly carefully to take account of internal dissent in ways that may lead to a nuanced response to each other’s campaign tactics. There are reasons to hope, therefore, that the very fact of a Brexit campaign will not become overly divisive in an already divided society, despite the opposing positions of the two main parties of government. However, the second key question for Northern Ireland is how a ‘leave’ vote might impact on Northern Ireland and the wider British-Irish relationship that underpins the political settlement. Here, there is much less reason to be optimistic about the consequences of a ‘leave’ vote. As with Scotland, polls suggest that Northern Ireland will vote decisively to remain within the EU. There are four key serious concerns about the effect of a ‘leave’ vote on Northern Ireland. First, joint membership of the EU and commitment to European values, such as those of the European Convention on Human Rights (ECHR), were a vital part of the context of the Northern Irish peace process. While the peace process was sold to Nationalists and Republicans as transformation of the Northern Irish State, the context of devolution and the close binding of the devolution framework to EU and ECHR law enabled Unionists to accept the project as one of ‘modernisation’ in line with the changes that were happening across the UK. Human rights and anti-discrimination law – transformative for Nationalists in ensuring that the new arrangements would not replicate the discriminatory devolution of the past – could be accepted by Unionists as a ‘normal’ part of the British (in Europe) context. Pulling the European platform from under the peace process fundamentally changes the political context in which people found themselves able to agree on contentious matters. Perhaps the political institutions can now weather this, but they are still far from any steady state of normal operation. Second, while the border was a major issue during the conflict, since the 1998 peace agreement this has been the ‘dog which has not barked’. The Republic of Ireland’s claim to the territory of Northern Ireland found in Articles 2 and 3 of its constitution was amended, and the UK implemented reciprocal commitments, such as incorporating the ECHR into UK law. The physical border was dismantled and freedom of movement, underpinned by a Common Travel Area (a sort of mini-Schengen between the UK and Ireland), has continued throughout. Cross-border movement, cooperation and trade have all been embraced by both Unionists and Nationalists and the removal of ‘the border’ from the arena of Unionist/Nationalist contention is a remarkable peace process achievement and was hard-won. This is the UK’s only land border with another country. If the UK were to leave the EU it would be difficult to see how the border could remain as open as it is today. Preventing immigration to the UK of EU-nationals who would have freedom of movement to Ireland, would only be possible by introducing strict border controls between the Republic of Ireland and Northern Ireland (or – even more contentious, but not without precedent – controls for entry to the rest of UK from Northern Ireland). The consequences of increased border controls and the re-erection of a dismantled physical border between the North and South would be disastrous politically and practically. For example, the second city in Northern Ireland – the majority nationalist Derry/Londonderry – essentially now has suburbs that sprawl over the border. People live and work on either side, crossing daily while working in essentially the same communal space carrying both euros and pounds and paying in either currency interchangeably on either side (the ATMs in Derry even dispense currency in euros if one wants). These cross-border hinterlands are replicated in dozens of rural farming communities along the border, which post-Brexit could find themselves with new physical barriers to circumvent, and under quite different trade regimes with other countries, depending what side of the road their cows graze on, where their house is, and where they got their passport from. If one counts trade moving both directions, cross-border trade is worth an estimated £65 billion annually. Whatever favourable relationships would be maintained, it is difficult to imagine Brexit and its consequences having absolutely no negative effect on this trade. A reduction of even a couple of per cent is a fairly devastating figure, and the upper-end figure of negative impact on trade is 20 per cent. 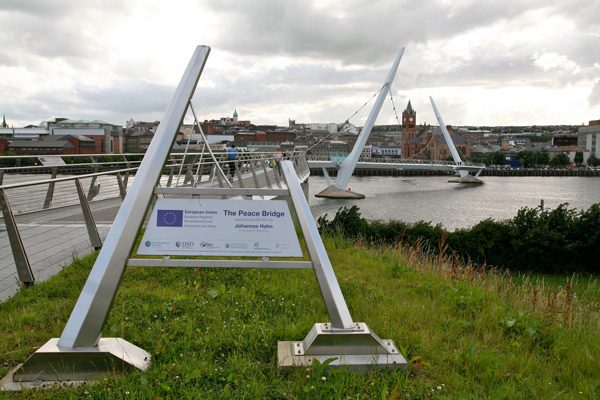 Finally, the EU has been central in funding the Northern Irish peace process. EU funding has arguably been a major key to the success of the implementation of the peace agreement. Since 1995, there have been three PEACE programmes, with a financial contribution of €1.3 billion. A fourth is in progress and will contribute £270 million. These have funded infrastructure, business, political reconciliation and civil society projects, all of which have striven to address the legacy of the conflict and create momentum for the peace process, with considerable success. It is of course possible – as with so many things – that the money the UK pays into the EU could be spent directly on these matters. But how likely is this in the UK now? Moreover, EU funding has been about more than just money – EU money has been perceived as ‘neutral’ in ways UK government money was not. EU funds have also been smart in their modalities. They have involved very innovative delivery mechanisms that forced collaboration across peace walls, business and civil society, and political divides in what is perhaps the major unsung implementation ‘clever tool’ story of any peace process in the world. Remembering that Northern Ireland has had a peace process claiming to have ended the violence almost every decade from 1920 until the Agreement in 1998, one has to take seriously everything that was done differently this time round. It also helped build British-Irish relations. It seems a more than a pity to undo the very cross-border cooperation that this programme has paid so much money for. All of these issues concern not just the peace process, but British-Irish relationships more generally – which perhaps can be said to be currently at their all-time high of any point in history. But the issues are fundamental to the peace process and for many the daily context of their lived lives. Brexit would be a massive kick to sleeping dogs that have been lying happily asleep for many years now. These dogs may of course yawn and lie down again, but that is quite a gamble and not usually what kicking sleeping dogs achieves. And the kick may perhaps happen without the consent of the people of the island of Ireland, North and South, whose consent to any change in their political settlement was so carefully negotiated and voted on across the island, with unquantifiable benefits to the whole of the UK. No one in Northern Ireland kids themselves: none of these issues will drive or be decisive in the debate across the UK. In fact, they may be lucky to get a mention in the mainstream national media. But perhaps the fact that the UK has a sensitive land border with another European country, and that the common context of EU membership underpins the end to a violent conflict, should be taken a little more seriously beyond Northern Ireland – or even at least noticed. This article was informed in part by a joint meeting on EU and British-Irish relations held by the Royal Irish Academy and British Academy on 1 March 2016. Views and opinions remain the author’s own.